Root canals suffer from a bad reputation as the epitome of painful dental procedures, but they’re comfortable and pain-free when the Heinbach-Larkin dental team performs them. If you have signs of an infection like a toothache, tender gums, or pain, please don’t wait to contact one of our offices in Topeka and Lawrence, Kansas, or schedule an appointment online. Their dentists take the time to calm your concerns, relieve your pain, and restore your tooth. A root canal is a procedure that seeks to save an infected tooth by removing damaged pulp, which is the soft area in the center of your tooth that contains blood vessels and nerves. Hard enamel usually protects the pulp, but decay and injuries create vulnerable areas that let bacteria get through the enamel to the pulp, causing infection. Pain — often severe pain — is the symptom experienced by most people in need of a root canal. Infected pulp is incredibly painful because it directly affects the nerves inside the tooth. The infection may spread beyond the tooth, creating an abscess, which only adds to the pain. 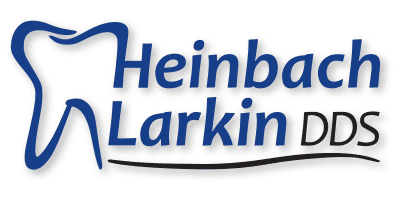 When you’re in pain due to a dental problem, please don’t hesitate to call Heinbach-Larkin Dental. They offer emergency services so you can get a quick dental exam and pain relief. Root canals are not as painful as you may have been led to believe. In fact, the procedure is comfortable in the expert hands of the dentists at Heinbach-Larkin Dental. Even administration of local anesthesia goes smoothly thanks to advanced technology found in the Wand STA Single Tooth Anesthesia System. This system eliminates long needles and prevents stinging when the injection is given. After you receive anesthesia, a slim, specially designed dental tool goes through the enamel to the pulp. Your dentist at Heinbach-Larkin Dental removes all of the pulp and cleans the root canal (the part of the tooth that holds the pulp). They then fill the center of the tooth with material that supports the tooth’s structure. If your tooth isn’t broken or cracked, the small opening may be filled. Otherwise, a crown is used to restore the tooth’s strength. How long will your tooth last after a root canal? The restored tooth can last a lifetime, as long as other dental issues don’t arise. If you still have the natural tooth, it’s susceptible to cavities. Even if it’s covered with a crown, the underlying tooth could decay if damage to the crown allows food and bacteria to get through. That’s why good oral hygiene is important. If you already have a root canal that needs attention, it’s best to get specialized care from an endodontist, so the team at Heinbach-Larkin Dental doesn’t re-treat existing root canals.